Sam, I know the feeling. I was a latecomer to SM and still find it unwieldy. I do enjoy blogging though, and mostly it's become a great resource for me. You have no idea how many photographs are only saved because they're on my blog...many were lost with hard-disk crashes, etc. I enjoy blogging, too, Vijaya, though only post once every two weeks because I was finding it too much of a time drain to write posts weekly. Includes discussion of copyright, licensed stock art, recreating graphics, and the pros and cons of creative commons images. Got tired of writing about cancer, so I did a post about the five (pretty terrible) holiday movies I'm watching this month. And before that, the funniest headlines during the 2018 midterm elections. Double-cross lit 99c/99p promos from Feb 2019. Such wonderful news! Happy Holidays!!! You are such a trouper DmGuay. Here's wishing you a happy, healthful, and write-ful 2019. Wishing you a happy and healthier 2019, DM Guay. I forgot about this thread, but I have been blogging. You can find some Christmas (one pic may not be quite safe for work) and New Year's Eve photos and I also waded into the hopepunk debate. I also have a review of Ordeal in Otherwhere by Andre Norton and the recipe for spaceman's punch, a vintage 1960s party drink, at Galactic Journey, a retro science fiction blog I sometimes contribute to. Finally, I also have a poem called "The Mystery of the Compost Heap" out in the poetry and photography zine Umbel & Panicle today. I started the new year with awarding the 2018 Darth Vader Parenthood Award for Outstandingly Horrible Fictional Parents on my blog and also posted an eligibility post type round-up of 2018 blog posts, guest posts and fiction publications. I blogged about the release of my newest title, Shattered Prisons. Now I want to set up a couple of beehives at the Bremen rhododendron park for scientific purposes. Meanwhile, I wrote a response to the latest "science fiction is broken/dying" article to point out that no, it's not. 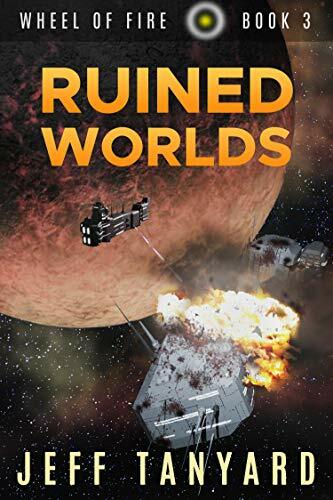 I have a guest post at the Skiffy and Fanty Show today, where I talk about my love for space opera as part of their Month of Joy project. I'm in the process of doing a "teardown to the studs" remodel of my website. It's probably going to take me the rest of the day to get it finished. I blogged about the return of Star Trek Discovery. I only blog when I have something to say, something that I just have to get out or it will annoy me too much. That was an entertaining mini-rant. Meanwhile, I rant about this year's rather lacklustre Academy Award nominees. Just got another author interview up on my blog. I like to focus on Indie authors, but I also interview small and mid press authors too. I'm doing the occational book review too, but the author interviews seem to be more popular. Love giving back to the Indie community and it gets content on my blog too. A look at some of my favourite, and not so favourite, books by one of my go-to authors, Stephen King. Couldn't stand Insomnia - I thought as I read it that my favourite author had taken one drug too many. The Green Mile upset me so much I stopped reading Stephen King books for a long time. I used to preorder everything he wrote, but couldn't get into some of his later ones. I think that's me, though; my tastes changing, crumbling probably along with my bones. It's good that our tastes differ so much - what a boring world it would be otherwise. And our tastes definitely change as we grow older. I used to get excited around November each year when he was due to release a new novel, but haven't felt that way for years. My latest entries are for my own most recent release (perpetual calendar paperback) & some author spotlight posts (requests from my Twitter offer). A detour to a National Park site during my weekend trip to Detroit.